Mid week, beautiful morning, a frosty start, and off to the Myrtle Forest in the foothills of Mount Wellington, where it was even colder. But the birding was great. Hadn't gone more than a hundred metres when I spotted an all white bird fly up to a perch among the saplings, all this a good way off. My first reaction was a Sulphur-crested, which often roost around here, but thinking on, what was it doing among the saplings? A brief look through the glasses, and I realised it was a Grey Goshawk (white morph in Tasmania). Every other birder tells me about their encounters with this hawk, even get them in their gardens, but I always seem to miss out, so for me it was a good start. It even looked as if I had an evens chance of some photographs, but a pair of Grey Currawongs had also spotted it, and they proceeded to give it a hard time. It took refuge well up an old acacia tree, where despite their best efforts, the currawongs couldn't easily mob it, but not for want of trying. I got a few poor shots through the foliage. It was as I was watching the goshawk from beneath its perch, that I heard the first Pink Robin calling, and soon sighted it as it called from a high perch overlooking the track. Not more than a hundred metres on, and the second and third came in sight, both hawking in a clearing next to the creek. A Brush Bronzewing, one of several seen during my walk, flew up from the track with their characteristic clapping of wings, and I could hear another calling from the hillside. On to the picnic huts, and I could just hear another Pink Robin above the noise of the creek, together with a Golden Whistler, and the clamouring of a small flock of Black Currawong. I took the old fire track at this point, overgrown at the start, but I've found it offers better birding opportunities. The Tasmanian Thornbills were also in good voice this morning, and I found them at regular intervals during the climb. I stopped to try to photograph a pair, and failed, but I had the bonus of finding the first of many Scrubtits, mostly in pairs, and an unsighted, scolding, Tasmanian Scrubwren, which are common in the area, but were even more skulking that usual, and I presume they're breeding at the moment. Four more calling male Pink Robins on the track, one of which I spent some time attempting to photograph, top 2 shots. This bird was wary of me at first, but later seem ed to accept my presence while it went about its business, albeit in poor light, under the tree canopy. Occasionally it propped only an arms length away--too close to photograph! Like most of our robins, the 'pinks' often hunt from a perch, dropping down and seizing prey, and I noted this one catch a variety of very small insects on the ground, but it also gleaned them from beneath leaves, as the thornbills do. At one point, it found an earthworm, bashed it a few times, before quickly swallowing it, something I've seen Flame and Dusky Robins do. The Dusky also takes skinks. Further up the track I came across one of several flocks of Strong-billed Honeyeaters, which judging by the frequent chasing, are, or soon will be, pairing up for breeding. I saw several Olive Whistlers, none calling as yet, and a few Golden Whistlers, that unlike their cousins, were in good voice, and paired. I counted at least 14 Pink Robins during my walk, all male, although one of them was still in the 'brown' plumage of an immature bird. I didn't see a single female pink. So I was left wondering whether they are breeding, or whether the males are advertising their territory to attract a mate. I've read various tomes that suggest that males, like the females and immature birds, wander during Winter. From my observations, males may range more widely during the colder months, but they can consistently be found at the same spots all year round, although, of course I have no way of knowing whether they're the same individuals! At the same clearing that I'd seen 2 'pinks' hawking earlier, one, very obligingly, posed in bright sunshine, and allowed close approach (image bottom right). A little perverse, when I had struggled to get any worthwhile shots in the 'gloom. But there's something about the Pink Robin that gets me trying to photograph them at every opportunity--they are gorgeous! Ah the irony. Two weeks ago I found two separate female Pink Robins; couldn't find a male anywhere! Where was that? Of course if the males kept quiet, I wouldn't have seen many of them either!! What great photos! I especially liked the one with the worm in his mouth. A very nice walk by the sound of it. Excellent photos! I seen a Pink Robin today at Fern Glade at Burnie. I managed one poor quality pic before it flew off never to be seen again. Was that Darter ever confirmed? It was a great morning, and had the benefit of bringing back a few mementos to share! Sharing the birds World while photographing, has made me realise how little I really know about many of our birds, despite having watched them for many years. I must confess to having a great number of "poor" shots of Pink Robins. Like Scrubtits, Tas. Thornbills and Tas Scrubwrens and a few others, they are often found in the heavily timbered country where photography is a "challenge". So the few "successes' are all the sweeter. I understand that the possible Darter record is the subject of an URRF, although comments from a few of us had already been requested (by BT). Even if the URRF is rejected, it doesn't mean that the bird wasn't a Darter, just that the information supplied didn't prove that it was. If you look back through the early records, there are some that wouldn't pass muster today, and I've often wondered whether there should be some purging, or an explanation attached to them, particularly given the field aids (binoculars, field guides etc.) were either non existent or inadequate. Shooting individuals was often resorted to and was once part of mainstream birding! Wonderful shots of the Pink Robins Alan, it's a species that continues to elude me over here on the mainland, have only seen the odd female in recent years. Thanks for your comments, much appreciated. I should also apologise for not visiting your blog more often. I see you've expanded your topics, a move which I've often contemplated, but sadly, I'm not as well versed in other areas of natural history as you obviously are. The literature that I've read infers that the Pink Robin has expanded northwards on the Mainland, although confusion with the similar Rose Robin, in the past, may have 'masked' the extent of its range. 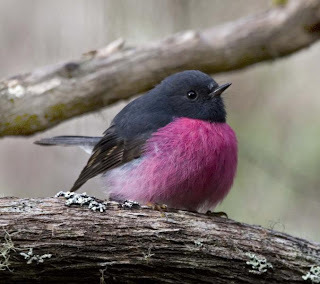 Great shots of the male Pink Robin Alan. I've only managed to snap a female 'Pink' at home, as the male won't show himself - a trip to the Myrtle Forest is obviously a must! The adult grey goshawk is not an easy bird to photograph well. Although I see one most days, the only times I have managed anything above a 'record shot' is when one was pinned down by ravens and carrying a freshly caught starling,and therefore not keen to leave its perch. Not an easy scenario to replicate on cue. They are adorable. Wonderful photographs! My two females were at Fern Tree and Wielangta. You should send the last one to Surfbirds.com and suggest they use it as a wallpaper for next month. It's as good as the ones they do choose. That first photo is stunning! I love how fluffy his breast feathers look. It is great to hear about all these wonderful birds so close to my home (I'm on the Eastern Shore). Thanks, Kris and Jen, I rarely miss an opportunity of photographing them, although most of the shots get binned. I believe the "fluffing" traps air and acts as an insulation. Many of the robins do this--no need for knitted jumpers, Jen! just wondering if the Myrtle Forest you are referring to is the 'Myrtle Gully' track leading off Old Farm Rd Cascades, or 'The Myrtle Forest Trail' at the back of Mt. Wellington via Collinsvale. My apologies to you and anyone else that I may have inadvertently misled! The Myrtle Forest is part of the Wellington Park, and is accessed via Collinsvale. From Collinsvale there are several signposts showing the way. Just be aware that the roads in the area are narrow, and the locals take no prisoners!